What Is Bilevel Positive Airway Pressure (BiPAP)? What is Bilevel or BiPAP Therapy for Sleep Apnea Treatment? In some situations, it may be advantageous to use an alternative to standard continuous positive airway pressure (CPAP) called bilevel positive airway pressure (BiPAP). What is BiPAP therapy and when is it most often used? Learn how BiPAP is used to treat obstructive sleep apnea and central sleep apnea by delivering two alternating pressures via a face mask. What Is BiPAP or Bilevel Therapy? Many of the components of a BiPAP machine are the same as the standard CPAP machine. For example, it still requires a face mask and tubing connected to the device. The key distinguishing feature of BiPAP is that the pressurized air is delivered at two alternating levels. The inspiratory positive airway pressure (IPAP) is higher and supports a breath as it is taken in. Conversely, the expiratory positive airway pressure (EPAP) is a lower pressure that allows you to comfortably breathe out. These pressures are preset based on a prescription provided by your sleep doctor and alternate just like your breathing pattern. Beyond these standard settings, there are a few other variations that are available. Bilevel ST includes the timed delivery of a breath if breathing pauses occur. These pauses are often present in central sleep apnea. In addition, auto or adaptive servo-ventilation (ASV) includes more sophisticated settings that vary the timing, length, and volume of the breaths that are delivered. 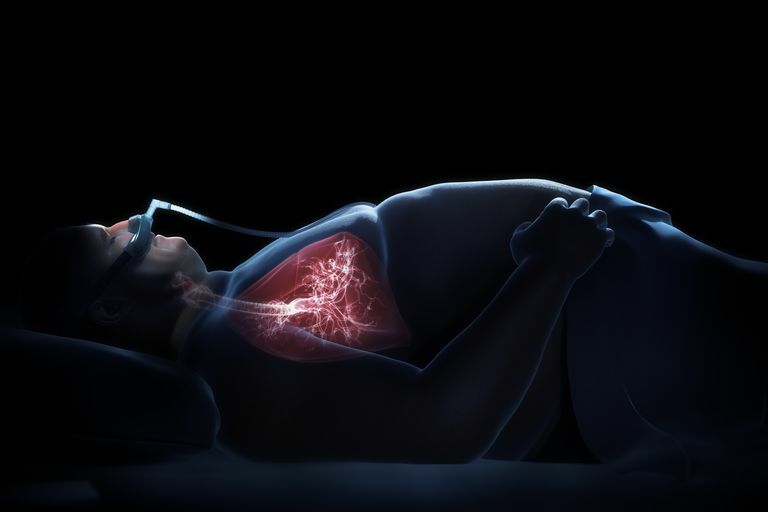 BiPAP is a method of breathing support that is often used to treat central sleep apnea, a condition that occurs in the setting of opioid use, congestive heart failure, and prior stroke. It may also be used in more severe obstructive sleep apnea, especially if mixed apnea events are present, suggesting a component of central sleep apnea. It may be used to treat people who cannot tolerate continuous positive airway pressure (CPAP), especially those who complain that it is difficult to breathe out against the pressure. This is more likely to occur at higher pressures when these are required to keep the airway open. Though this threshold varies, it often is needed at pressures higher than 15 centimeters of water pressure (CWP). It may help to improve compliance among those who are struggling with CPAP therapy. In addition, it is a non-invasive means of support that can be used in hospitalized people who are in respiratory distress but who do not wish to be placed on a ventilator. It may be helpful in those with neuromuscular weakness, such as may occur with amyotrophic lateral sclerosis (ALS). Different Names: How Does BiPAP Differ from VPAP Therapy? There is some confusion about the word BiPAP itself, especially how it differs from bilevel. These are actually the same thing. The names of the device will vary somewhat based on the manufacturer. One of the major manufacturers of these devices, Respironics, has registered BiPAP as a trademark name for the technology that is generically called bilevel. The other major competitor, ResMed, calls similar devices VPAP (abbreviating variable positive airway pressure). ResMed now markets a device called AirCurve that is a bilevel device. Though the names may be different, the basic principles are the same. How to Decide: Do I Need CPAP or BiPAP? In most cases of obstructive sleep apnea, CPAP alone is sufficient as a therapy. In the more complicated scenarios described above, or when it is difficult to tolerate CPAP, BiPAP may prove to be a useful alternative. Most people will start therapy with CPAP and if needed a titration study can be performed to determine the setting required for optimal response to bilevel therapy. It should be noted that BiPAP is more expensive than a standard CPAP machine. It may be priced at two or three times the cost of a CPAP. The ASV models may cost more than $4,000. Bilevel positive airway pressure (BiPAP) serves as an alternative to CPAP that can be used to treat those with central sleep apnea, those who cannot tolerate the continuous positive airway pressure, and those hospitalized with respiratory distress who do not wish to be placed on a ventilator. If you are curious whether BiPAP would be an appropriate therapy for you, you can start by speaking with your sleep doctor. After an assessment of your risk factors and, as needed, selective testing, the proper treatment can be provided to resolve your condition. This is a decision best made in consultation with your physician who will be prescribing the therapy. Reeves-Hoche, MK et al. "Continuous versus bilevel positive airway pressure for obstructive sleep apnea." Am J Respir Crit Care Med 1995;151:443. Javaheri, S and Brown, LK. “Positive airway pressure therapy for hyperventilatory central sleep apnea: idiopathic, heart failure, cerebrovascular disease, and high altitude.” Sleep Med Clin. 2017; 12(4):565-572. Mansukhani, MP et al. “Bilevel positive airway pressure for obstructive sleep apnea.” Expert Rev Med Devices. 2014; 11(3):283–294.